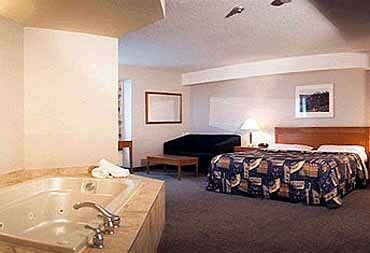 The Four Points By The Falls in Niagara Falls is a full service hotel awaiting your arrival at the Honeymoon Capital of the World in Niagara Falls Ontario which is the 7th Wonder of the World. Whether you are planning your honeymoon, a business trip or a family outing - this is one of the most exciting and historic destinations. 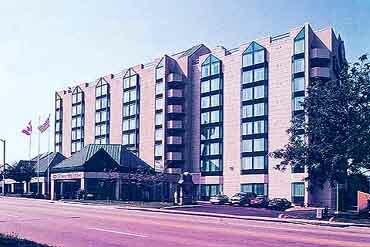 The Four Points By The Falls, carries a rating of 3 crowns and is a Sheraton Hotel which is one of the most trusted and popular international hotel chains in the world. The Four Points has 192 spacious, luxury guest rooms and suites which are modern and fully equipped to provide you with a private honeymoon or getaway. Each unit is fully soundproofed and has individual controls for heating and air conditioning. In-room amenities include in-room coffee maker, iron and ironing board, in-room movies, cable TV, hairdryer, radio and telephones. Upon request, some rooms have private balconies, city views, fireplace, in-room Jacuzzi, sitting areas and business desk with lamp. The hotel offers services which include maid service, non-smoking rooms, 24-hour front desk, parking facilities, room service, laundry service, safe deposit boxes and wake-up services. The Four Points has an on-site Dahlia's Lounge for your refreshment and relaxation. The Dahlia's Family Dining restaurant offers Italian cuisine in an atrium setting and serves breakfast, lunch and dinner. At your service is a full service Business Center which offers faxing, copying and secretarial assistance. Banquet and meeting rooms are available with audio-visual systems. There is a state-of-the-art fitness facility, indoor heated pool and sauna for the guests year-round enjoyment. 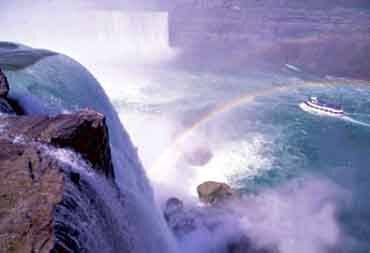 The hotel is situated just a few minutes walk from the falls and the newest attraction of the Casino Niagara. The Four Points is located in the center of the hub of activity in Niagara Falls. The Imax Theatre is only 1 block, as is the Skylon Tower which rises 775 feet above the falls with its exterior elevators and revolving dining restaurant. Other attractions include Dragon Mountain, the world's largest steel roller coaster and Marineland featuring marine animal shows. For the golf enthusiast there is the Oaklands Golf Course which is only 3 kilometers. The professional staff of the Sheraton Four Points By The Falls awaits to assist and insure your visit is a successful one.